Christmas is coming!!! Wanna look the part but don’t have the time to sit in a salon. All you need is China Glaze’s White on White, and Milani’s Red Sparkle, along with….Scotch tape and a steady hand of course . It is pretty straight forward what you have to do to achieve this look. Want to see a tutorial pop over to Chloe’s Nails and check her out the girl sure does know her stuff. I wonder if there is such a thing as scented nail polish? 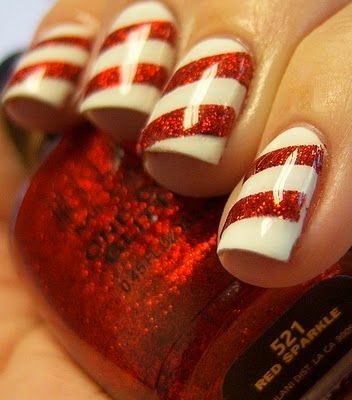 How good would it be to not only have nails that look like candy canes but smell like them too!! Photo courtesy of Chloe’s Nails – Love your work girl! OMG, lovin the whole idea! Now if only they made peppermint scented fingernail polish….